Oil Down is the national dish of Grenada. On weekends, Grenadans like going to the beach in groups, bringing the ingredients and making a slow cooking communal meal. 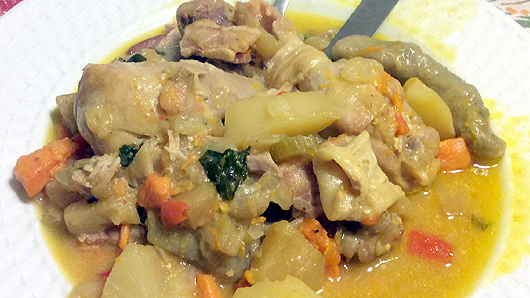 There are many local variants, that utilize fresh local ingredients, but they all seem to contain starchy vegetables, breadfruit and saltpork or fish. I adapted two versions of the dish into my version, but I can't say it was too successful. The dish just lacked flavor. Still, it was fun to make and I was happy to try breadfruit for the first time - though I didn't particularly like it. Heat oil over medium-high heat on a large cooking pot. Add the onion, garlic, celery and carrot and saute until the veggies soften. Add red pepper, basil and thyme and saute for a couple of minutes. Add the chicken pieces. Add the yams and potatoes and then the breadfruit. Add the salt pork or bacon. Pour coconut milk and water. Add turmeric, salt and pepper. Bring to a boil and then simmer on low, uncovered, for 30 minutes. Add the spinach and the spinners and cook for another 30 minutes. Adjust seasoning and serve. Adapted from the official recipe by the Government of Grenada and Becca's recipe at Meat Loves Salt blog.